Hamish (left) and his brother Duncan. At less than a year old, Scotties Hamish and Duncan learned what it meant to fight for your life as they watched their Scottie Mom battle the disease that is expected to kill nearly 40,000 American women this year alone: breast cancer. Though they were young, Hamish and Duncan watched over their Scottie Mom and doted on her with unconditional Scottie Love to help her through this difficult time. They were there to greet her at the door each time she came home from her chemotherapy and radiation treatments and they were always happy to do what Scotties do best: make their hoomans happy! Thanks to Hamish and Duncan's support (and to medical treatments, a little perseverance, and a strong will to live! ), their Scottie Mom kicked the evil "C" to the curb and is still thriving eight years later. Little Hamish, who obviously learned a thing or two about being a fighter and how to beat the odds from his Scottie Mom, has since been diagnosed with canine diabetes. For over four years now, he has had to rely on his Scottie Mom to give him two insulin injections every day. He's on a special diet and has chosen carrots as his treat of choice these days. Each morning and night, instead of running away from the insulin needle, he trots over to his Scottie Mom like a little trooper to get his shot and, of course, a carrot or two. Canine diabetes isn't Hamish's only issue. He also suffers from ear problems, skin infections and dry eyes. With all the trips to the V-E-T his conditions must require, one would think Hamish might be ready to throw in the towel but such is not the case. In fact, Hamish has taken every curve ball life has thrown him in stride and continues to live his best life with his Scottie brother Duncan by his side. Again, having learned a thing or two from his brave Scottie Mom and her battle with the evil "C," it is no wonder Hamish continues to inspire those around him to look past the circumstances given, make the most of the situation and when a loved one is going through a difficult time, be there for them with a smile on your face and tail-a-wagging! 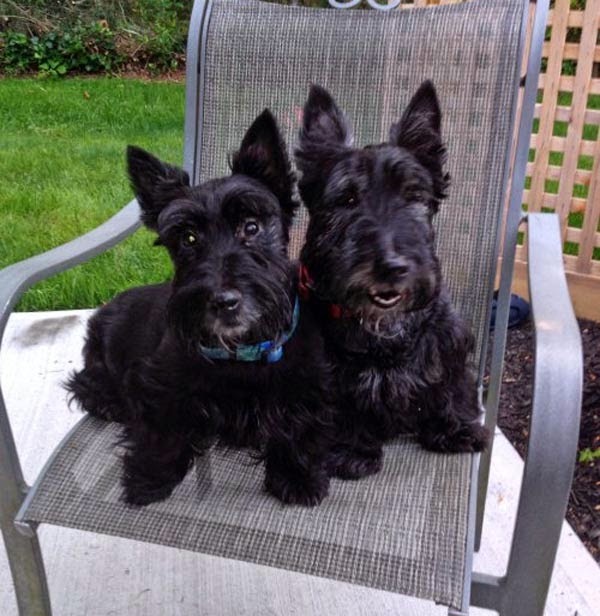 Many thanks to Hamish and Duncan's Scottie Mom for sharing her precious pup's story and much love goes out to you from the Scottie Mom community during Breast Cancer Awareness Month. I'm sure Hamish and Duncan will join me in my plea for women everywhere to get yearly mammograms in an effort to detect - and ultimately defeat - breast cancer earlier. For those interested in submitting your Scottie’s story for consideration as a Be Inspired by a Scottie piece, please send an email to thescottiemom(at)gmail(dot)com. We will be praying for you Hamish and keeping our fingers crossed for you. And please give our best wishes to your Mom peep and brother, Duncan. The three of you are a real inspiration to all of us! Carrots and frozen green beans have been my treats for a while-it helps prevent diabetes. I thought about little Hamish all night long after reading this. What a brave boy he is! Love, prayers, and blessings to his Scottie Mom!